Sat Nav point: Gate B, Temple Island Meadows, Remenham Lane, Henley-on-Thames, RG9 3DB. Leave the M4 at junction 8/9 and join the A404 (M) towards Henley and High Wycombe. Join the A4130 towards Henley for about 4 miles. At the top of Remenham Hill, turn right into Remenham Church Lane. At the T junction, turn left towards Henley. Once you see the blue road signs to Temple Island Meadows, please follow these signs to Gate B for the car park. 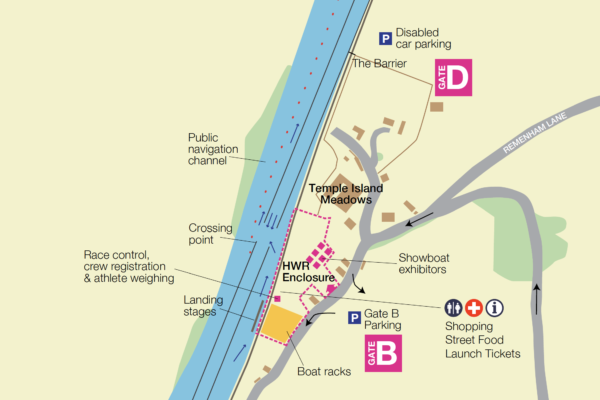 The regatta will be signposted, with the car park on your left-hand side. Gate B car park is free to park until Friday 21st June when charges apply. Please note if you have left your car overnight on Thursday you will need to pay on Friday. All towing vehicles must register in advance for a free pass. Vehicles and boat trailers must NOT enter via the Henley Bridge junction & must follow the one way system not just on race days but during the week prior to racing. Please make sure that your trailer driver is aware of this. Pre registered Volunteer Parking – Please contact HWR if you have not received you volunteer parking pass. Car Park Prices Gate B and D for 2019 and booking . Pre-bookings will close on Tuesday 18th June at midday after which tickets can be purchased on the day at the higher rate. Disabled Parking is charged at the same rate but is in an accessible area. For accessibility information please click here. All towing vehicles must be registered in advance, if you don’t know the vehicle details you can still register and log in to update the details pre event once the details are confirmed. If you arrive with a registered ticket and the registration number is not that registered then you will have to pay full price per day onsite. Your ticket will be valid for your towing vehicle when delivering, collecting or staying onsite. If your vehicle is not a genuine towing vehicle you will be charged full price on the day per day. You will NOT be allowed to enter without a trailer on this ticket unless you are collecting your trailer. 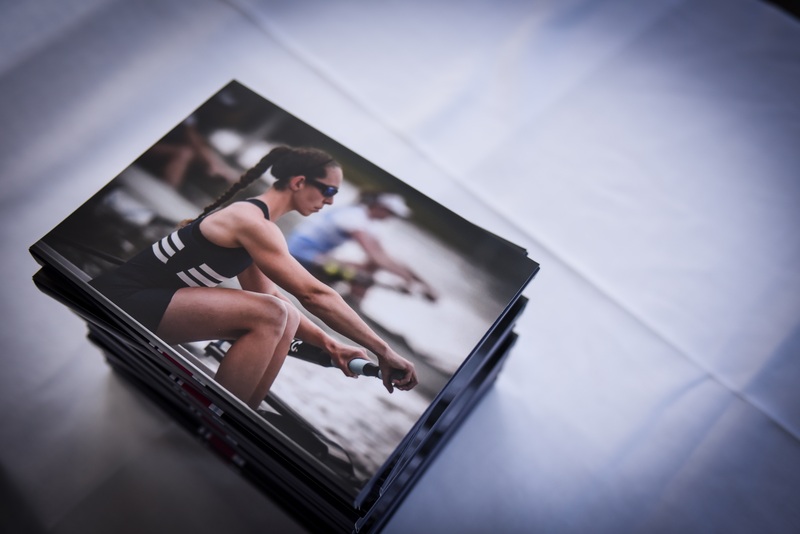 Cars bringing sculling boats may apply for a trailer pass but will only be allowed in with this pass as long as they have a boat on top of the car and will only be allowed back in to collect the boat. Car parking fees are paid directly to The Venue. Please have your cash or printed tickets ready at the car park entrance. Tickets on phones are not accepted. If you have no ticket or money you will not be able to park. The Venue and HWR accept no responsibility for vehicles or property in Gate B Car park, Please do not leave valuables in your vehicle. Please note there is a parking suspension along Remnham Lane, Remenham Church Lane and by The church and your vehicle is likely to be towed, as well as blocking the lane you will face a hefty fine and inconvenience of retrieving your car. Rail travel to Henley Women’s Regatta is simple, as there is a National Rail Station in Henley. Rent a car (the drive is approximately 35 minutes). Take the train to Henley Station (approx 90 minutes): Take the Heathrow Express to London Paddington. Take the GWR towards Oxford to Twyford Station. At Twyford switch platforms to take the GWR to Henley-on-Thames. Please contact these companies directly to pre-book. Please also note that other firms are available. You will need to book direct and HWR accepts no responsibility for the service provided. Other taxi companies are available. 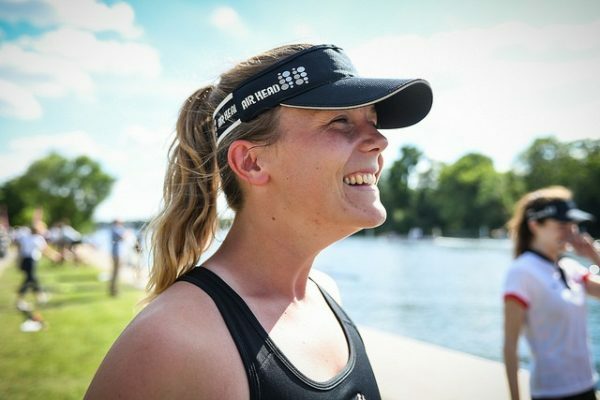 Please give the driver the Gate Location you require e.g Gate B (Temple Island Meadows, Gate F – Upper Thames Rowing Club, Gate G – Remenham Club, and advise of the one way system. For accessibility information please click here.